The Challenge Cup Pocono IndyCar, multi-purpose event to promote the Series is fast approaching! The weekend will allow seat time in a relatively low stress environment for drivers new to Formula Vee racing and as a bonus also included IndyCar race weekend spectator passes for all entrants. A course will be laid out in the Pocono infield that combine twisty bits along with a couple long straightaways and some high-speed curves. Many of the regular Challenge Cup drivers will be loaning their prized vehicles to those interested in getting behind the wheel. Many veteran Challenge Cup drivers will perform high-speed demonstration laps in front of the large IndyCar crowd as well. It is sure to be an exciting exhibition weekend for fans, drivers and supports of the Challenge Cup Series. After the successful Challenge Cup Pocono Tri-Oval, three-abreast demo pace lap last year, the series plans to replicate this one again on the high banks at Pocono. 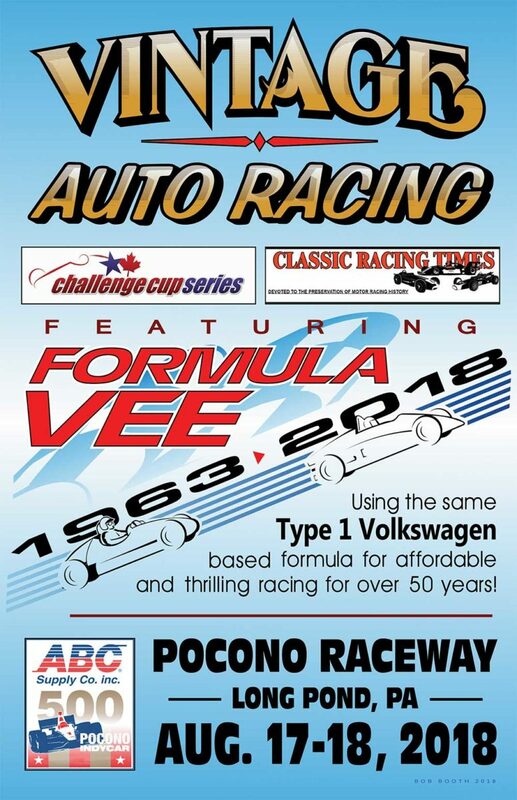 Afterwards, all the Challenge Cup cars will be put on display in the paddock area and an information table will be set up to answer questions from the many individuals curious about the Series and Formula Vee racing. The 2017 Challenge Cup IndyCar Pocono event was considered to be both a success from the entrants perspective and also from a promotional point of view for the Series. We look forward to another memorable weekend at the racetrack August 18-20, 2018. Is there someone specific to contact regarding the FV Tryouts? I’d like to come down and see what FV is all about. The ApexSpeed website pointed me your way.